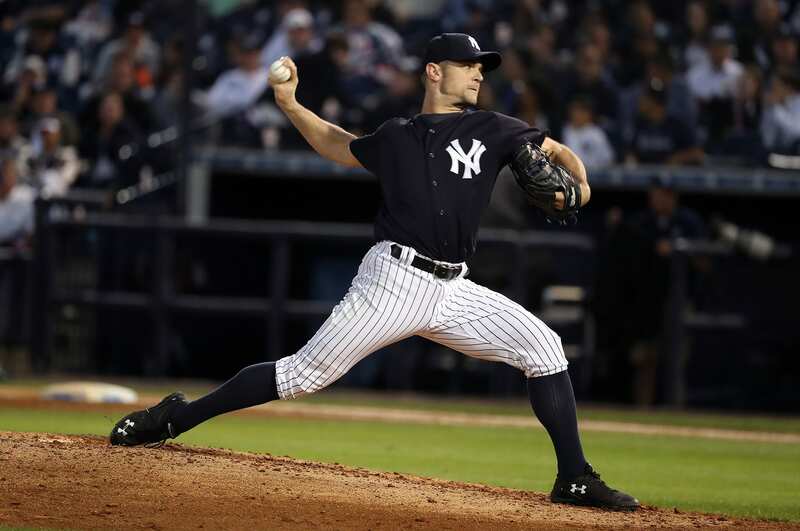 David Robertson never really wanted to leave the New York Yankees Yankees following the 2014 season, but when the Yankees decided to sign Andrew Miller, Robertson moved on. When he was reacquired at last years trade deadline many Yankees fans were elated to have the high socks back in Pinstripes. D-Rob is a true pro who can pitch in New York and will always give 110 percent. He is one of the nicest guys in the game and hopefully he gets to finish out his career in the Bronx. Robertson is from Birmingham, Alabama and played baseball at two High Schools. He spent his freshman through junior years at Central-Tuscaloosa High School and in his senior year he attended Paul W. Bryant High School. Robertson went on to pitch for the University of Alabama and was dominate. He was named to the Freshman All-SEC team and a Freshman All-American by Baseball America. In his sophomore year, and his final at Alabama, he led the SEC in saves and with his dominance Alabama won their 25th SEC Championship. The Yankees selected Robertson in the 17th round of the 2006 draft. Robertson made it to the majors quickly. He debuted on June 29, 2008 and appeared in 25 games in the 2008 season. Robertson did not make the Yankees Opening Day roster in 2009 .but played a big role in their run to championship 27. This was the start of his dominate career as a reliever. Robertson did make the Yankees 2010 Opening Day roster and had a solid season. His career took off in 2011 as he complied 100 strikeouts, led the league in ERA and holds. Robertson also earned his first All-Star Game nod in 2011 and was named This Year in Baseball’s Setup Man of the Year. In 2012 Robertson had another great season as he primarily served as Rafael Soriano’s set-up man when Mariano Rivera went down with a torn ACL. In 2013, Robertson was the set-up man for Rivera in his final season and was fantastic. He pitched in 70 games and had an ERA of 2.04. When Rivera retired in 2014 Robertson became the Yankees closer. Robertson posted amazing numbers as Rivera’s replacement and many thought the Yankees would lock him up. They ultimately did not and when he turned down their qualifying offer he signed a 4 year 64 million dollar deal with the White Sox. Robertson was the White Sox closer for his two and half seasons he spent with the Sox. He was solid and proved that he was a dominate major league closer. Throughout his time in Chicago it was speculated that the White Sox would trade him. They eventually did last year when they decided to enter a rebuild. They eventually dealt him back to the Yankees along with Tommy Kahnle and Todd Frazier. When Robertson returned to the Yankees it felt like he never actually did leave, he is personally my favorite reliever in all of baseball. Robertson showed why he belongs in Pinstripes as he was a leader in the pen and team that helped propel the team back to the playoffs. He was amazing in the Wild Card Game as he pitched in 3 1/3 and threw 52 pitches which was his career high. Robertson is entering the final year of his contract that he signed with the White Sox. I expect the Yankees will resign him once the season ends because they realize that he needs to finish his career with the Yankees. Robertson will have give Aaron Boone the luxury of inserting him wherever he needs him to, most likely in the 8th and also in some save opportunities. Robertson is glad to be back in the Bronx and the whole Yankees Universe is glad to have D-Rob back for a full season.